Back since ancient times, hundreds of years before the Pilgrims even existed, there has been a Hawaiian custom of observing the Makahiki. Makahiki means New Year (the Hawaiian greeting for Happy New Year is: Hau'oli Makahiki Hou) but it also signifies the period of time when the Hawaiians would put aside wars and work and celebrated the harvest and their blessing with cleansing, feasting, games and much more. Unlike our own Thanksgiving, the Makahiki was not observed for just one day....it lasted between 4 to 5 months starting sometime between October and November and ending between February and March...it all depended on "The Pleiades", a cluster of stars that appears in the eastern sky close to sunset sometime in late October....the "Time of the Makahiki" lasted as long as you could see The Pleiades in the sky. The Makahiki was observed as an homage to their god Lono who was the god of fertility and abundance and though details of the celebration varied slightly from island to island, they all featured Lono as the center of the feasting. We commonly call the Pleiades the 'Seven Sisters', although the cluster is composed of about 500 hundred stars unseen by the naked eye, and they usually appear in the sky during the harvest season and have been associated with harvest even as far back as during the time of Homer who mentions them in The Illiad written about 750 BC. According to Robert Burnham's book (Celestial Handbook:An Observer's Guide to the Universe - 1978) they were seen in connection to the agricultural seasons of that time. Burnham also points out that the name "Pleiades" may be derived from either the Greek word for "to sail", or the word "pleios" meaning "full" or "many". It is amazing to me that the early Hawaiians associated the "Pleiades" with full or many (plenty) and that they carried banners, which looked like sails made of kapa (tapa) cloth on poles as they progressed in processions from settlement to settlement all around the island in honor of Lono. Some people even put the first mention of them earlier than that, but it has not been proved. By the way, the name of The Pleiades in Japanese is "Subaru". The Japanese telescope on top of Mauna Kea on the Big Island is appropriately called The Subaru. Hau`oli Lâ Ho`omaika`i - Happy Thanksgiving to All! 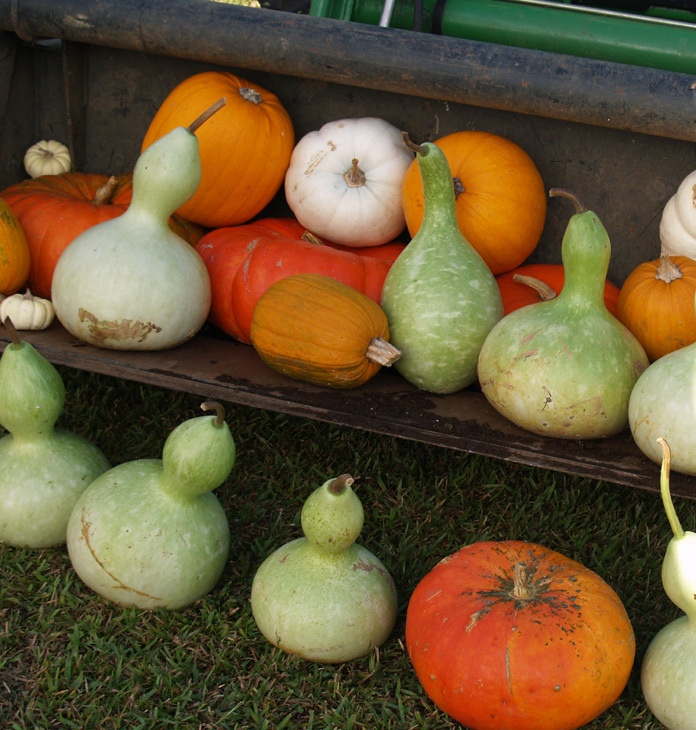 Grown' challenge during the month of October, the first of what will turn out to be the annual Hamakua Alive! Fest was held Saturday, October 27th at the Pa'auilo Elementary and Middle School grounds in conjunction with the school's annual Blue & White Fundraising Fair. As any of us who has planned any type of event knows, it takes more than just an idea and many people working together to make it happen. To this effect, several more people were contacted and as the idea caught on, several more meetings were held with more and more farmers and other food producers, chefs, food writers and interested parties joining in. 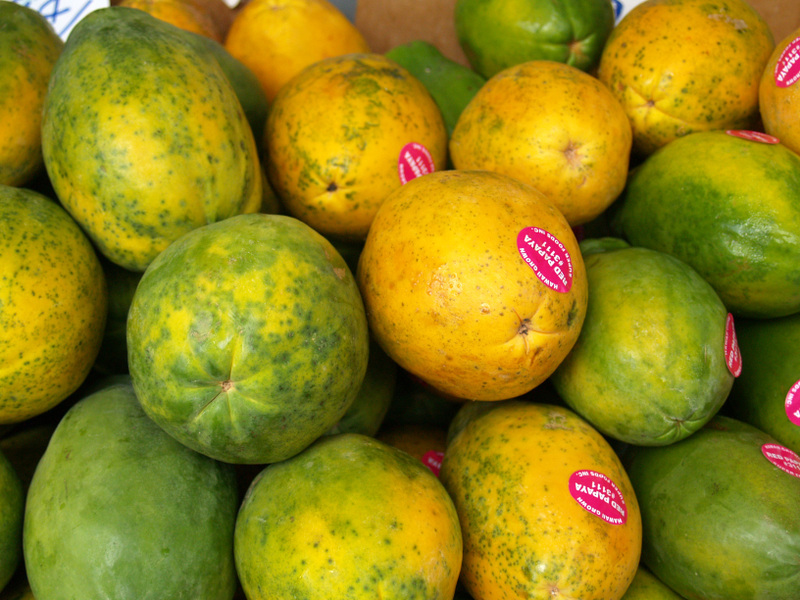 The result was Hamakua Alive! 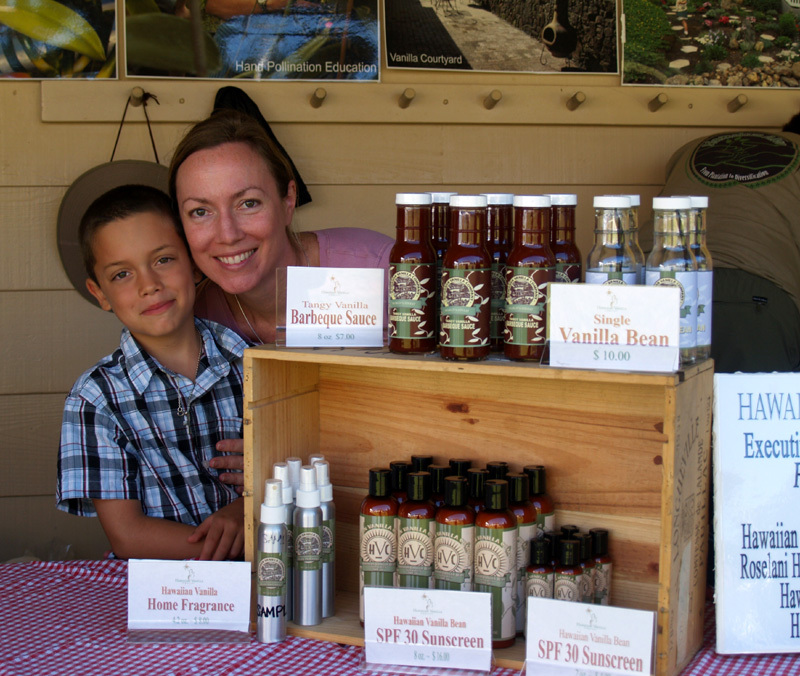 Each of the following farmers, growers and producers were there manning booths with samples and tastings of their products. Food samples ran from $1 to $3 each for what was more than generous portions. Threlfall was represented with an assortment of samples of their different flavored chevre; plain; dill-garlic, chipotle pepper, Tocoro (manzana) pepper and their best seller, macnut basil pesto. 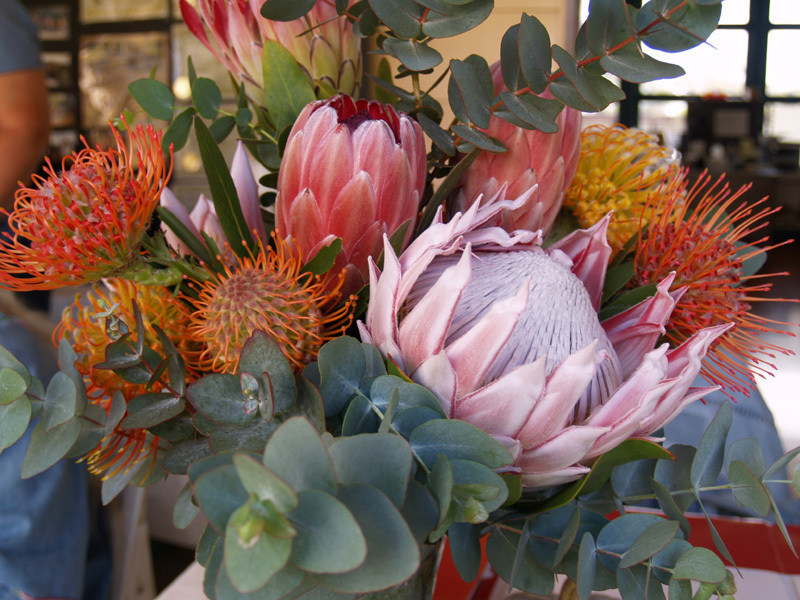 The High Country Protea Farm from Honoka'a owned by Anne St. Johns and Richard Berman was also represented with a beautiful arrangement using an assortment of protea and silver dollar eucalyptus. 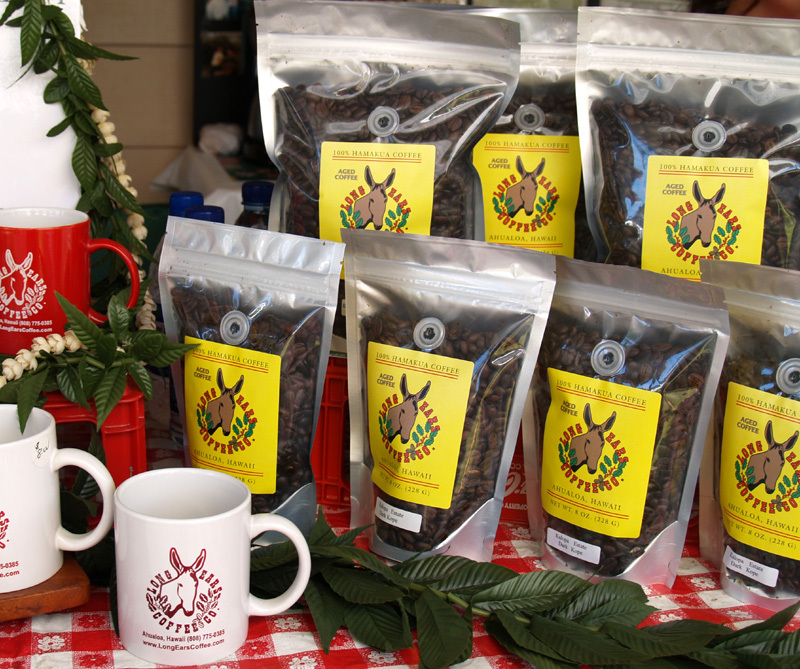 The Long Ears Coffee Company also from Honoka'a was represented by their owners Wendell and Netta Branco with an assortment of coffee and coffee tastings, mugs, T-shirts and other products their company produces.
. At this time they offer oolong, black and green tea and hopefully soon they might be able to produce enough of their delicious white tea to offer for sale. 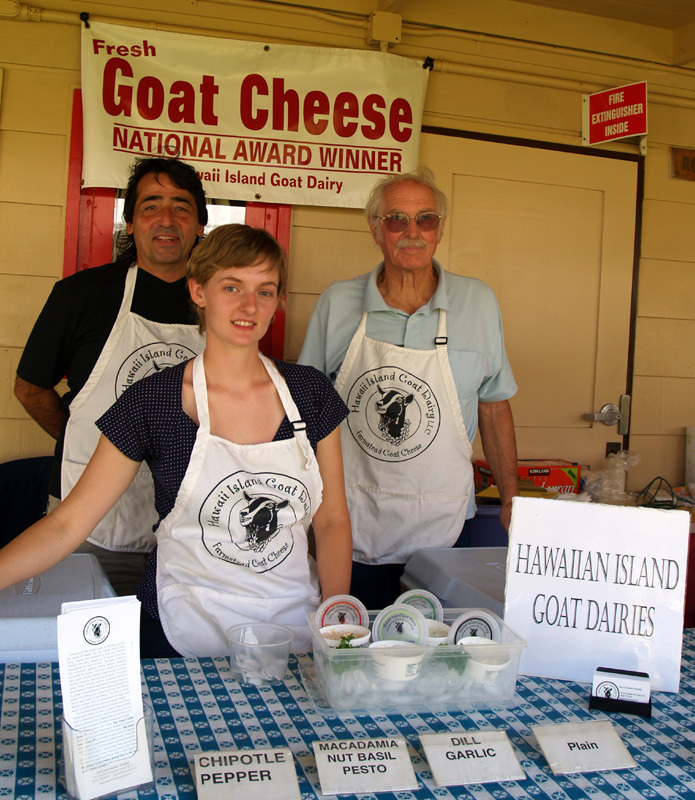 Waimea area was represented by owners Kimberly and Takahiro (Taka) Ino. 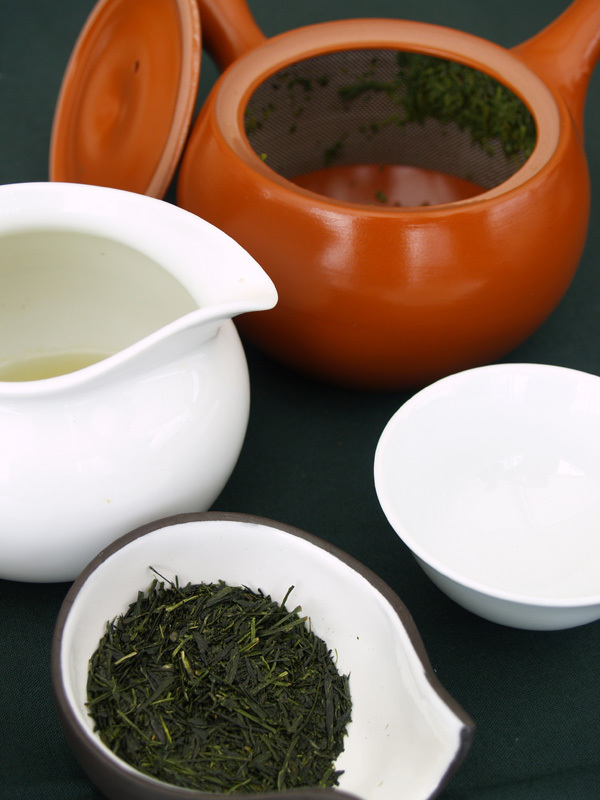 Three of their teas were offered for tastings. 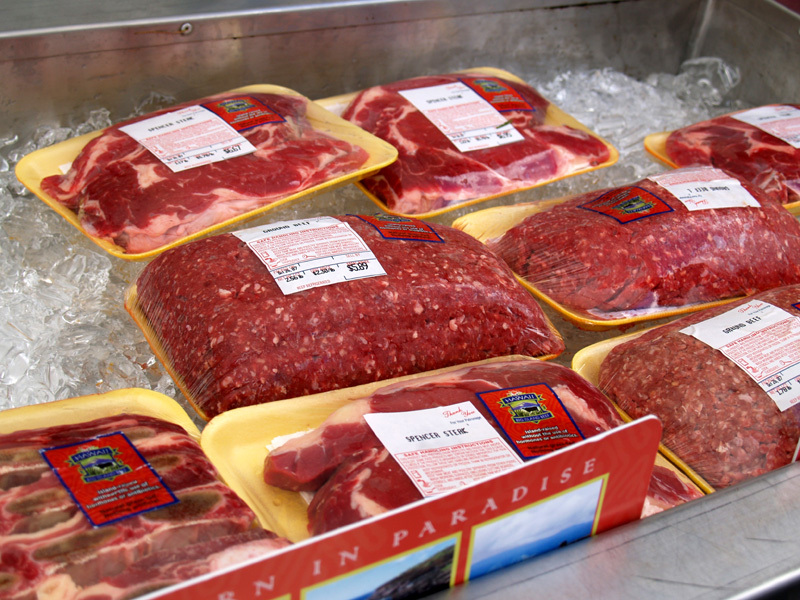 grown grass feed beef. Their booth was offering samples of teriyaki beef on sticks and spam musubi as a plate lunch. The musubi was part of the fund raising effort by the school. Blossom honey and also beeswax tapers. grown vanilla beans including Roselani Hawaiian Vanilla Bean Ice Cream, Hawaiian Vanilla Lemonade and Hawaiian Vanilla Coffee. As main organizer and chair for the event, Jim was also busy running all over the campus tending to every minute detail and sharing duties with Hawai'i County Councilman Dominic Yagong as part time emcee. 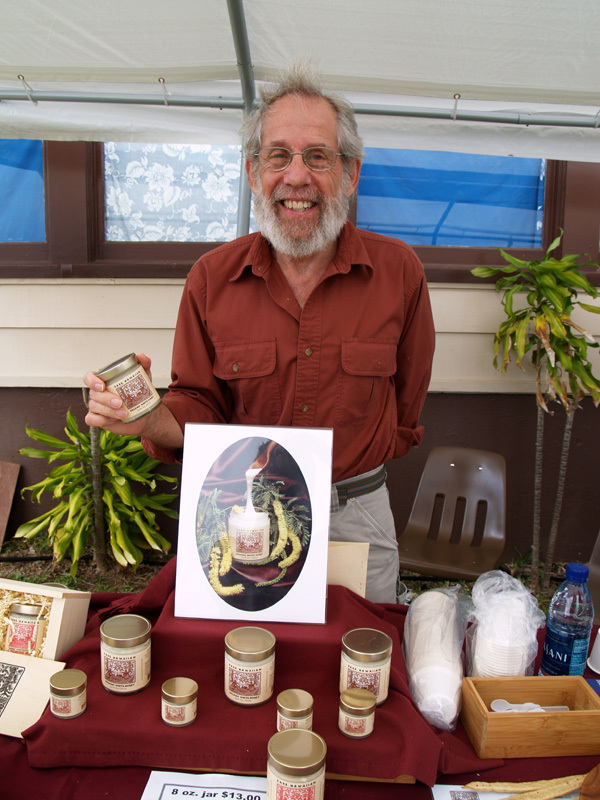 The Hamakua Heritage Mushroom Farm of Laupahoehoe owned by Robert and Janice Stanga showcased samples of their Brown Hon-shimeji, Pepeiao, Kea Hon-shimeji, Grey Oyster and Ali'i Oyster mushrooms. 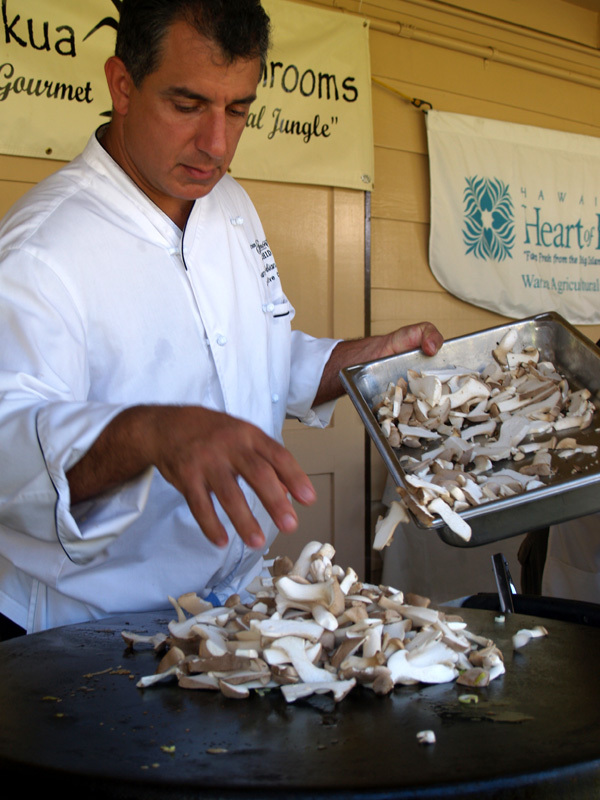 Anchoring between the Vanilla Farm and the Hamakua Mushroom booths was Executive Chef James Babian from The Grill, The Fairmont Orchid Hotel's signature restaurant. His rich and earthy Hawaiian Vanilla Lobster Bisque and the Sautéed Hamakua Heritage Mushrooms were big hits with the crowd. 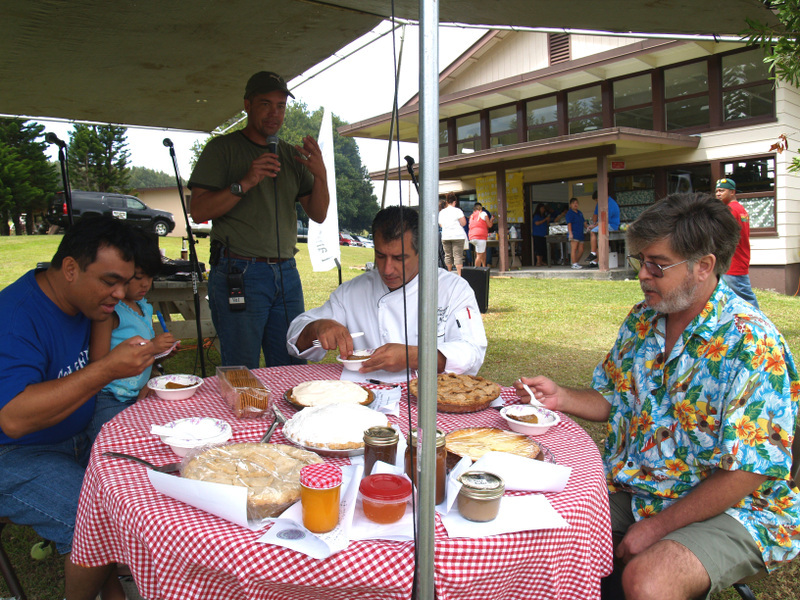 As part of the event there was a pie and jams and jelly recipe contest. 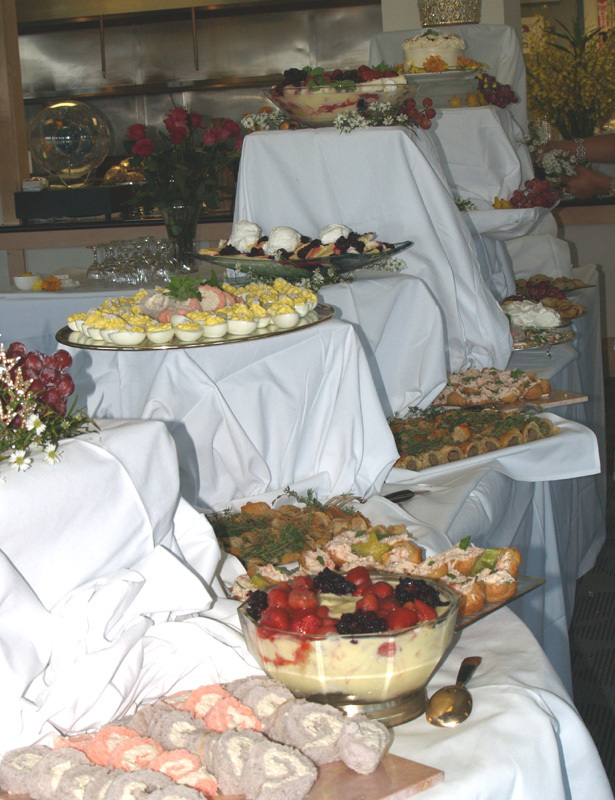 One of the rules was that locally grown fruit had to be used in the recipes presented for judging. The judges for the contest were Councilman Dominic Yagong, Chef James Babian and Anthony Mathis. The judges seemed to be having a very good time tasting the offerings. Anthony, who is my son, later mentioned that even with just small tastings he was later bouncing off the walls due to all the sweets….! 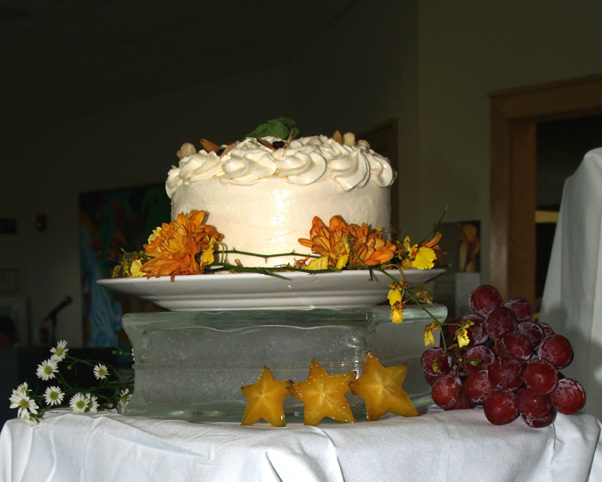 1st Place - Christine Young – Liliko'i Cheesecake - $100. 2nd Place - Emma Reddekopp - Hawaiian Vanilla Pumpkin Spice Pie -$75. - Elizabeth Glenn – Liliko'i Cream Pie - $50. 1st Place - Pat Anderson – Liliko'i Plus - $100. 2nd Place - Noah Glenn - Keanakolu Apple Butter - $75. 3rd Place - Mistuko Uyeda – Liliko'i Butter - $50. 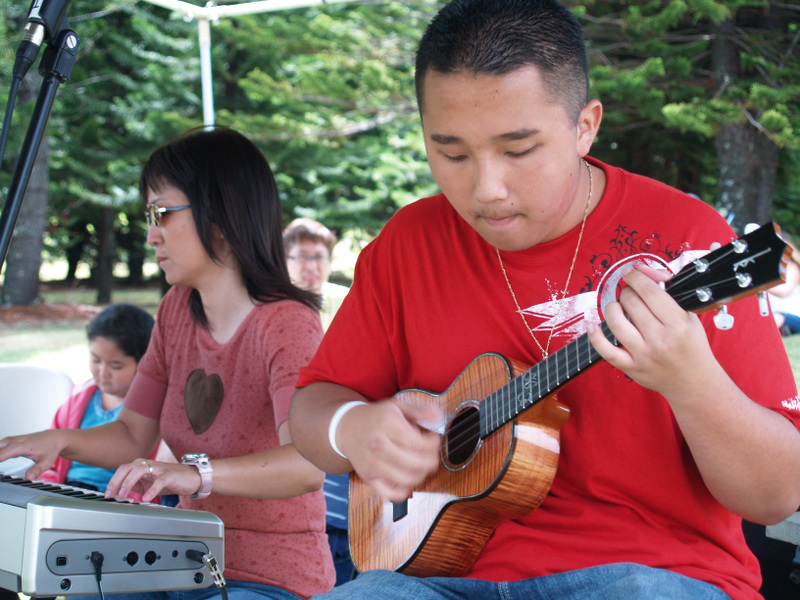 Live entertainment was provided by a mother and son duo from Kea’au; talented 16 year old ukulele prodigy Kris Fuchigami and his mother Keiko at the electric keyboard. Keep your eyes and ears open for more from this talented young man. Hamakua, please make plans to join in next year. Already the date is set for October 25, 2008 - Harvest Moon! 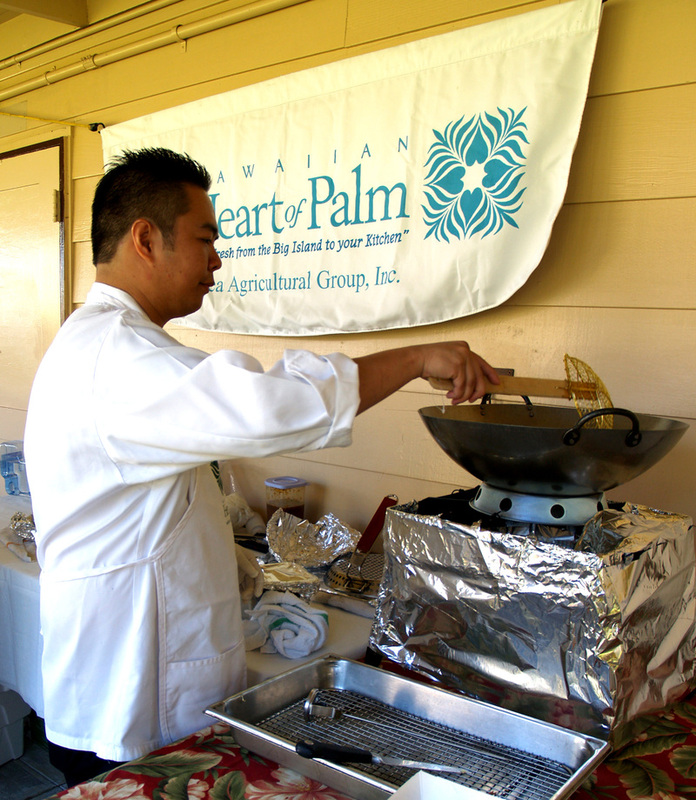 We recently attended a wonderful food event nearby which I predict will become "the foodie event of East Hawaii" very quickly. I will share more on this a bit later, but I wanted to share this salad which I made with Hawaii grown heart of palm I received as a gift from our friends Michael and Leslie who own Wailea Agricultural Group not too far from us. Leslie and Michael's company had a booth at the 'Hamakua Alive' event. First, let me explain, there are some varieties of heart of palm that to get to the edible part you need to chop down the whole plant, thus killing it, which never made sense to me. The heart of palm grown and sold by Leslie and Michael is from the peach palm, which sends out 'shoots' around the main palm trunk, and these shoots are what is cut, so the palm continues to grow and produce without having to be killed. (*) I will write more about heart of palm in the near future, but today I just wanted to share this wonderful salad. 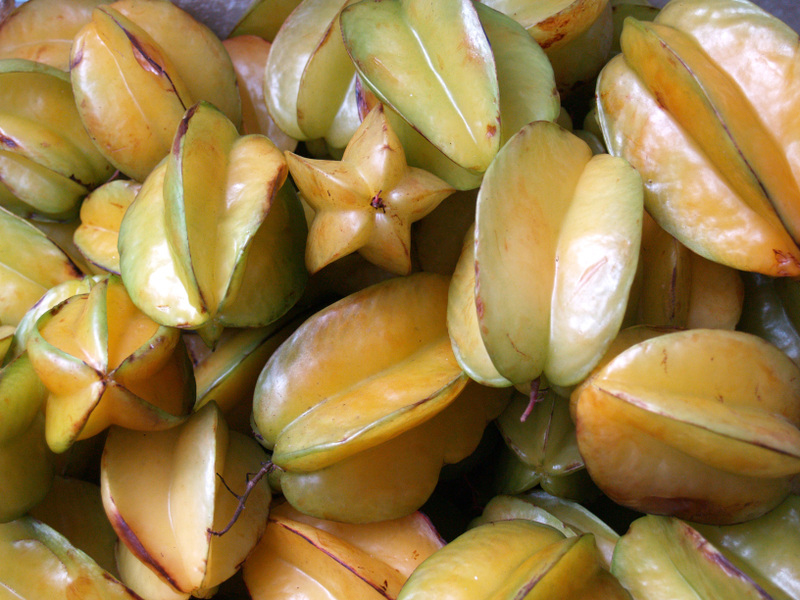 (*) I used a combination of Malabar and Moluccan (Dawn Dewa or Sambung Nyawa) spinachs from our garden. The pineapple sage leaves and blooms also came from our garden. 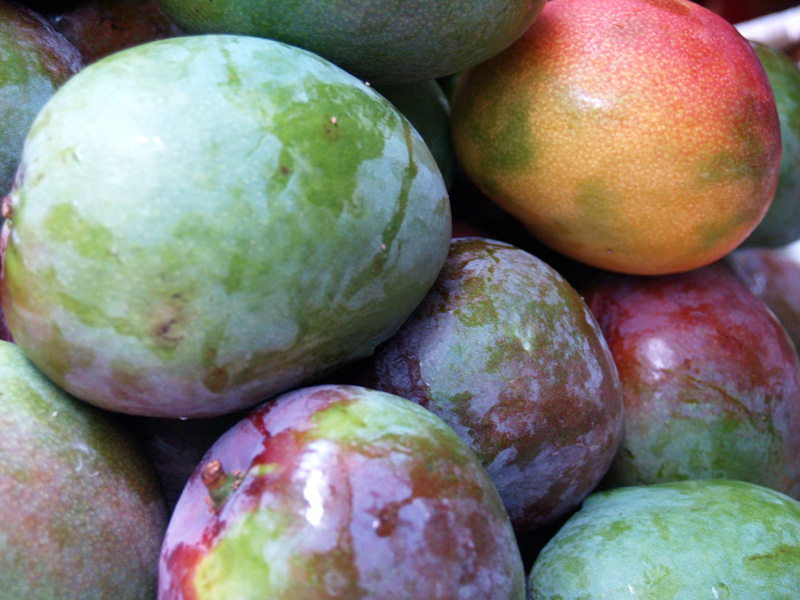 The passion fruit vinaigrette was also made from fruit collected from our yard. Pick and wash the greens early in the morning. Pat dry with paper towels and refrigerate stored in separate ziplock bags until ready to put the salad together. 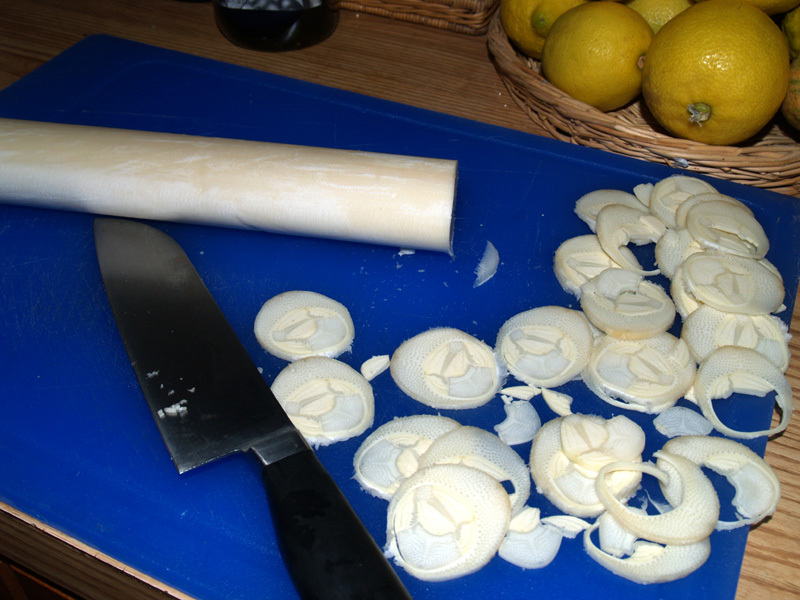 Slice the heart of palm stem in thin slices. Store, covered in refrigerator until ready to assemble the salad. Scatter some of the pineapple sage leaves over the two other spinachs. Place the sliced heart of palm on top of the greens and then scatter a bit more of the chiffonade of Moluccan (Dawn Dewa) spinach and a few more pineapple sage leaves on top. Scatter the red blooms of the pineapple sage over all. Drizzle with the liliko'i (passion fruit) vinaigrette. 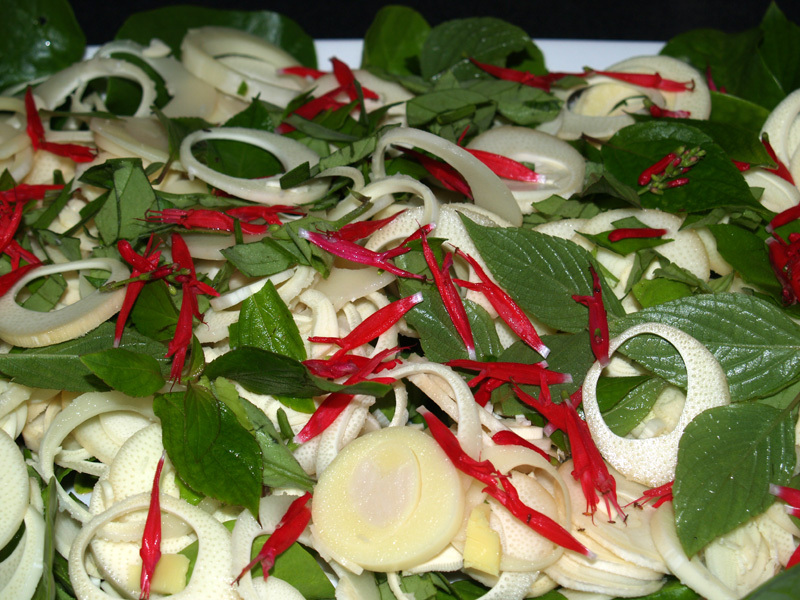 (*) A chiffonade of greens is actually any fresh greens that have been cut in thin ribbons. To make a chiffonade, take a handful of green leaves: basil, lettuce, cabbage, spinach, etc. and loosely wad up under your hand over a cutting board. With a very shap knife (I like to use my Santuko knife) and with rocking motions, cut across the wad of greens to make thin slices to form the ribbons. As you can see, it makes a very festive salad. It was also very ono (delicious) or like we sometimes say in Hawai'i, onolicious! 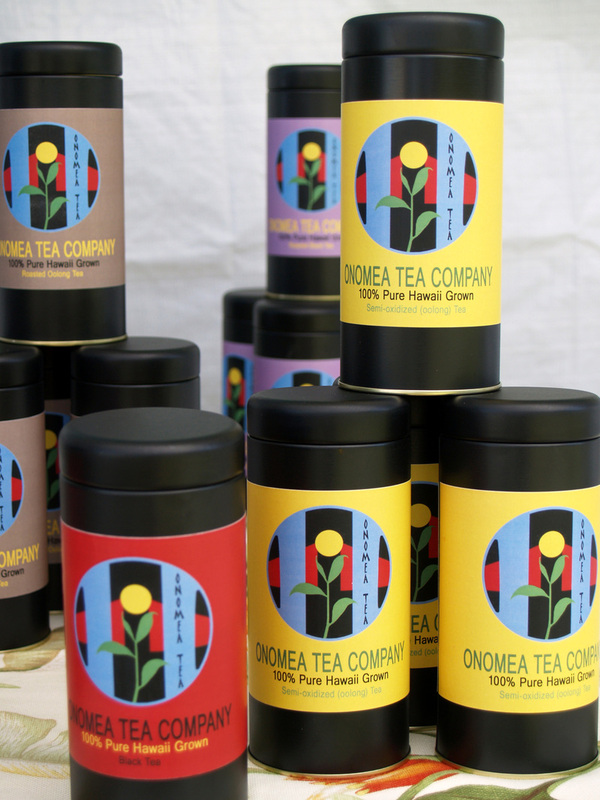 The pleasant custom of taking a leisurely tea in the afternoon was adopted by Hawaiian Royalty between the mid and the late 1880's even though it had long been the practice of the British families who first settled in our islands in earlier years. 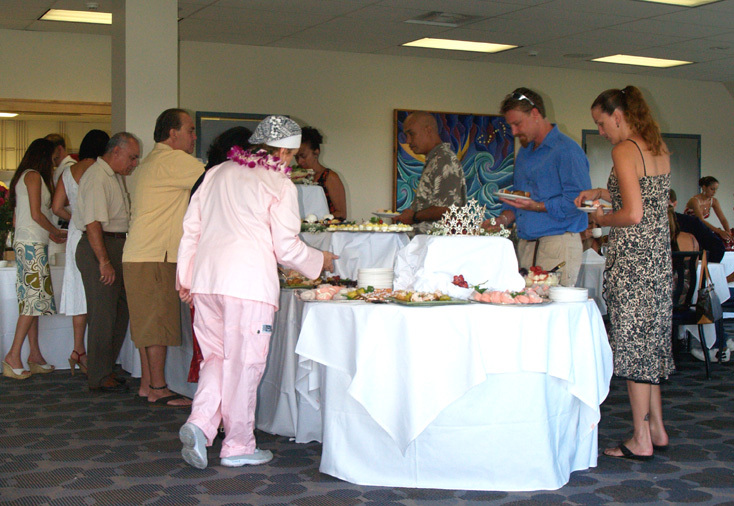 There are several hotels and Inns around the different islands who continue the tradition of serving a Hawaiian High Tea to this day. Although to the British the term High Tea refers to an evening meal, to the Hawaiian Royalty who adopted the custom if meant a very substancial repast consisting of a big assortment of fancy finger foods and decadent desserts, and that is how it is still known today. and Kate Johnson, a tea expert and importer of tea from all over the world. The guests tasted seven tea blends during the event and each blend was explained by Ms Johnson as the staff served at the tables. Pink Palace Garden Palace: Black & Green tea- Jasmine & Earl Grey notes. Each table was decorated with a glass bud vase and a ceramic or porcelain tea pot. A printed card listing the tea selections was also available on each table. 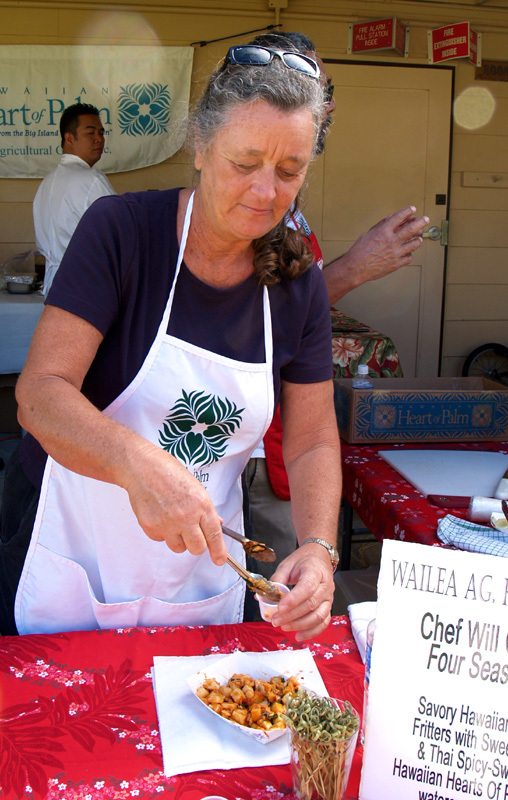 The delicious food was the inspiration and creation of ‘Imiloa Café Chef Rebecca Cook and her staff using as much of the Big Island's produce and products as possible. 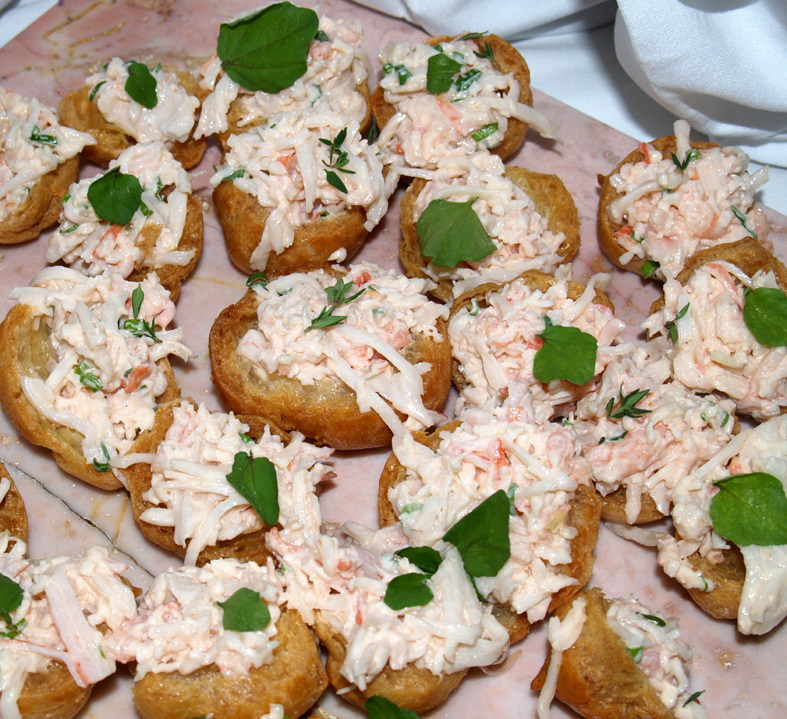 Chef Cook’s passion for food becomes obvious as soon as you tasted the goat cheese tarts, sausages wrapped in curried puff pastry, choux paste tidbits filled with crab salads, mini scones with fresh cream and delicious mini Russian tea cakes. 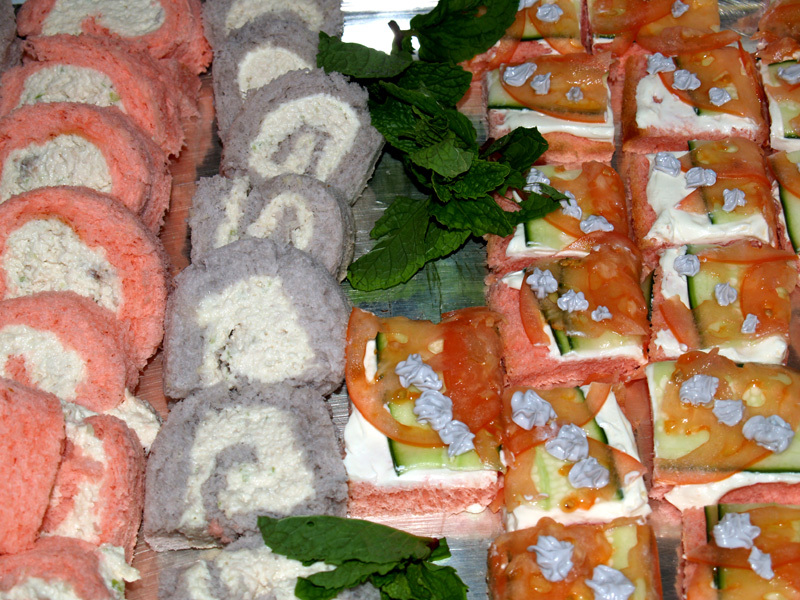 Small open face sandwiches were made with local poi and guava bread garnished with thinly sliced cucumbers and tissue paper thin slices of Hamakua grown tomatoes. The 'Imiloa Cafe is located at the 'Imiloa Astronomy Center just above the University of Hawaii at Hilo Campus. 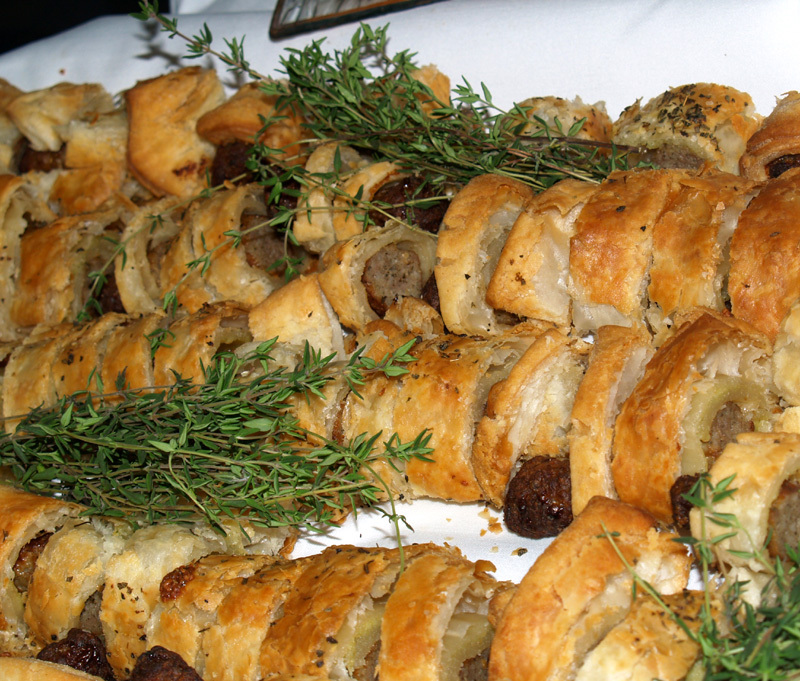 One of my foodie internet friends, an American who lives in Lebanon shared a version of this recipe a few years ago. 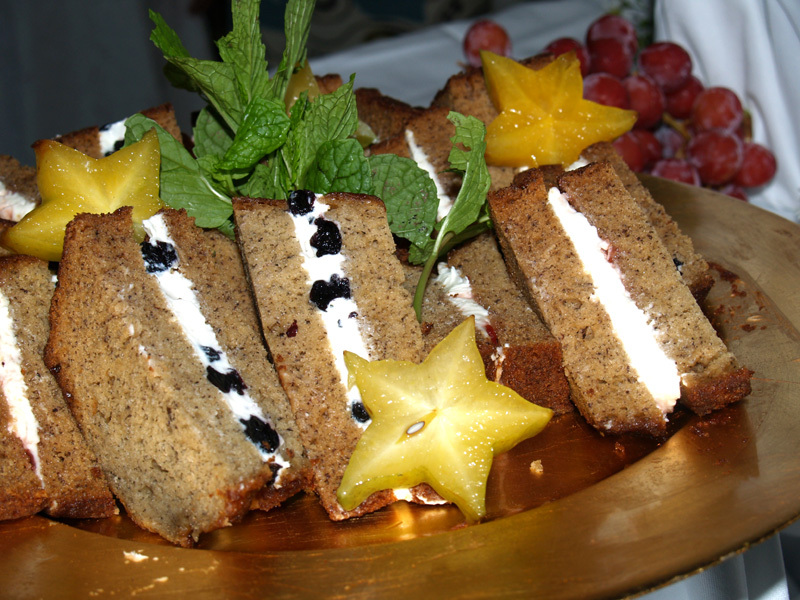 It has since become one of our traditional desserts for Thanksgiving or any other Fall event dinner. The original recipe called for vanilla pudding. 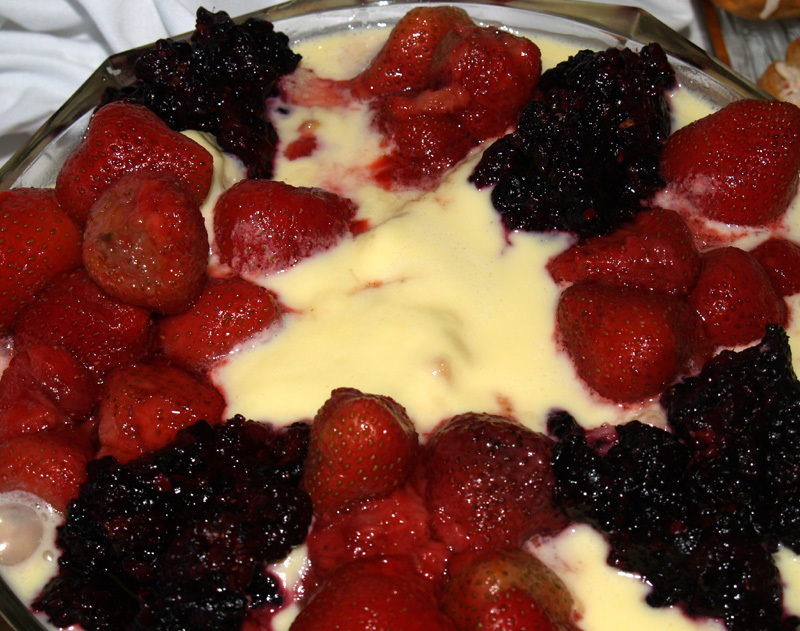 I have since started using a combination of vanilla and butterscotch puddings which everyone seems to like better. I have also been using homemade whipped cream instead of the cool whipped topping as originally given. Get all the ingredients together before hand as the pudding will set quickly and you don't want to waste time hunting for anything. Mix pudding with skim milk; when almost set (which will be almost instantly), quickly fold in all the other ingredients, being careful to not overmix the whipped cream as you fold it into the pudding mix. 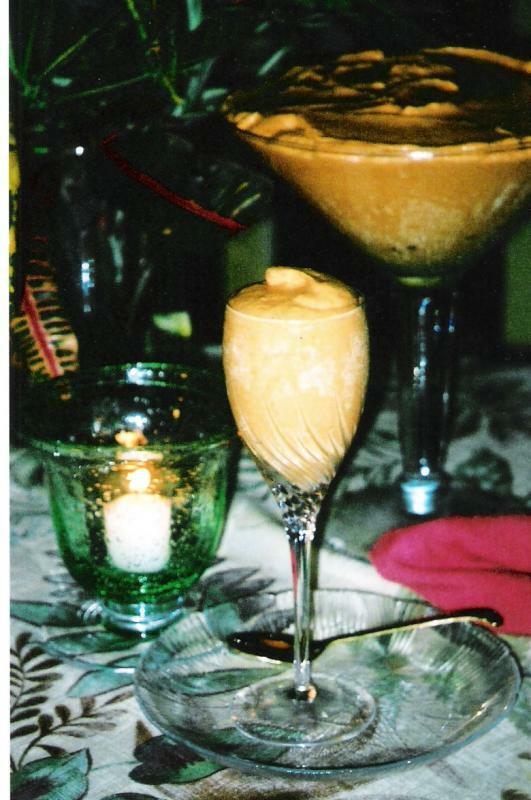 Serve in individual wine glasses or in a clear glass pedestal bowl and sprinkle pumpkin pie spice on top, if using.